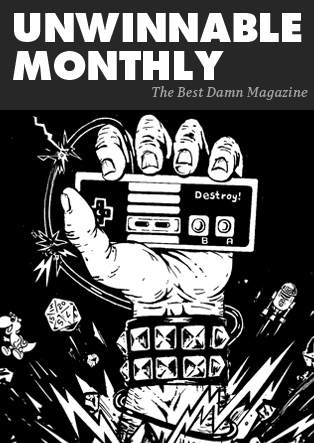 This is a reprint of the Letter from the Editor from Unwinnable Monthly #111. If you like what you see, grab the magazine for less than ten dollars, or subscribe as part of our Holiday Subscription Drive for two bucks and get all the back issues free. Happy new year! After the swirl of the holidays, January has been a bit sleepy here at Unwinnable, but we’ve still put together a fun, interesting and unusually timely issue for you this month nonetheless. 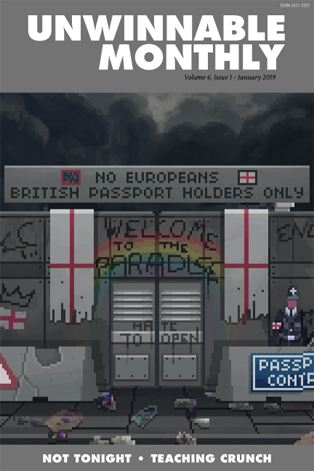 Our cover story this month, by Rob Haines, looks at Not Tonight, a game about being a doorman in a xenophobic post-Brexit UK. If you’ve been watching the news out of Britain the last couple days, well, let’s just say we’ve been updating the story right up to release. Game development crunch — the toxic practice of working punishing hours, often without commensurate pay, towards the end of the development cycle — has increasingly been a topic of concern within the industry as developers have moved toward unionization. Our second feature, by Melissa Brinks, looks at how certain university game design programs are initiating a new generation of developers into the culture of crunch. Unsettling stuff. Instead of looking at a game, our sponsored feature this month looks at Kara Technologies and their work on an avatar that translates multimedia into sign language for young, hearing impaired learners. It is an impressive piece of educational technology. Now, on to the columns. Gavin Craig ponders the binding of Isaac (the biblical story, not the videogame). Megan Condis compares the film Welcome to Marwen to the source material documentary Marwencol. Astrid Budgor, as ever, assaults our ears with new metal albums to blast beat in the new year. Deirdre Coyle sings the praises of Rochelle from Left 4 Dead 2’s Depeche Mode t-shirt. Ben Sailer looks at Resynth, a game that plays with the process of songwriting. Corey Milne prepares for a 10-month voyage into unknown space. Matt Marrone sings the praises of The Haunting of Hill House’s Bent-Neck Lady. Meanwhile, I read some Ursula Le Guin and fundamentally re-evaluate my perception of tabletop roleplaying games. Sara Clemens returns to Tom Bissell’s Extra Lives and makes a startling conclusion. Rob Rich sings the praises of the second-string super hero movies. Jason McMaster looks at Mooncrash. Finally, we chat with Ana Kim about her dream-like art. See ya in February in the all books special issue of Exploits!